The Storm Prediction Center is charged with issuing severe weather outlooks for the continental United States. A division of the National Weather Service, the ‘SPC’ issues outlooks for days one through eight. These outlooks are used by emergency management, broadcast media, and private sector interests. With the advent of the internet, these outlooks are accessible to the public. The severe weather outlooks for the next three days are available on this page. Click on any image for a higher-resolution version. Scroll down for an explanation on how these outlooks are created and how the risk scale works. 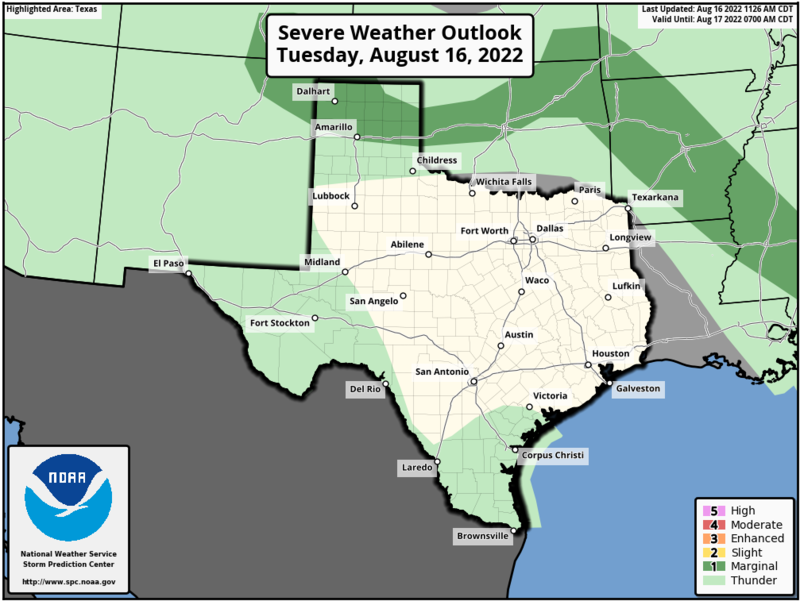 The ‘Day 1’ severe weather outlook is updated five times a day. These outlooks are issued at 1 AM, 8 AM, 11:30 AM, 3 PM, and 8 PM during daylight savings time. Subtract one hour during standard time (Nov-Mar). For a definition of the risk scale please scroll down. 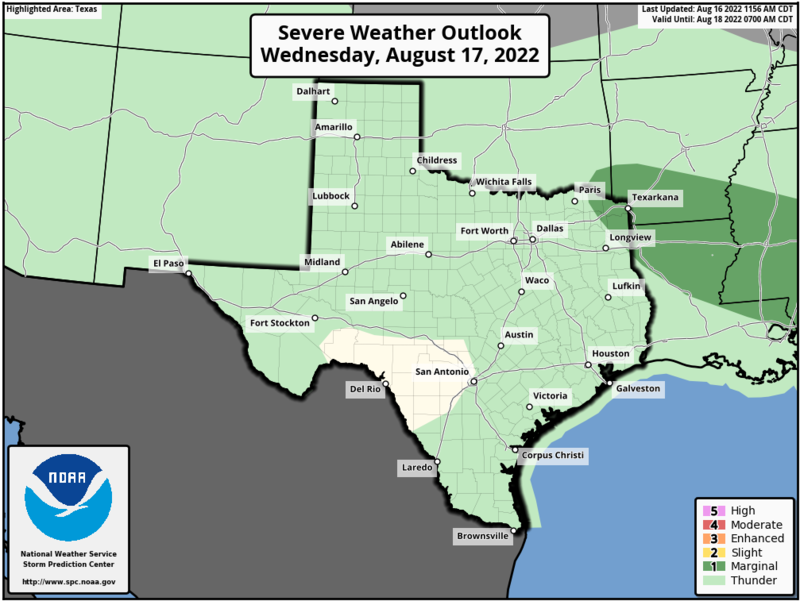 The ‘Day 2’ severe weather outlook is updated twice a day. These outlooks are issued at 1 AM and at 12:30 PM during daylight savings time. Subtract one hour during standard time (Nov-Mar). For a definition of the risk scale please scroll down. The ‘Day 3’ severe weather outlook is updated once a day around 2:30 AM CDT. For a definition of the risk scale please scroll down. The Storm Prediction Center uses a five-level risk system to define potential severe weather risks. Level one is the lowest and level five is the highest. Level one and level two are the most commonly issued. Level three through level five become progressively rarer. A higher risk level means a higher probability of severe weather impacting your area. Another way to think about the risks is using a color-risk scale. From the lowest risk to highest the colors transition from green to yellow to orange to red to pink. While dangerous in its own right, lightning has no role in determining if a thunderstorm is ‘severe’. 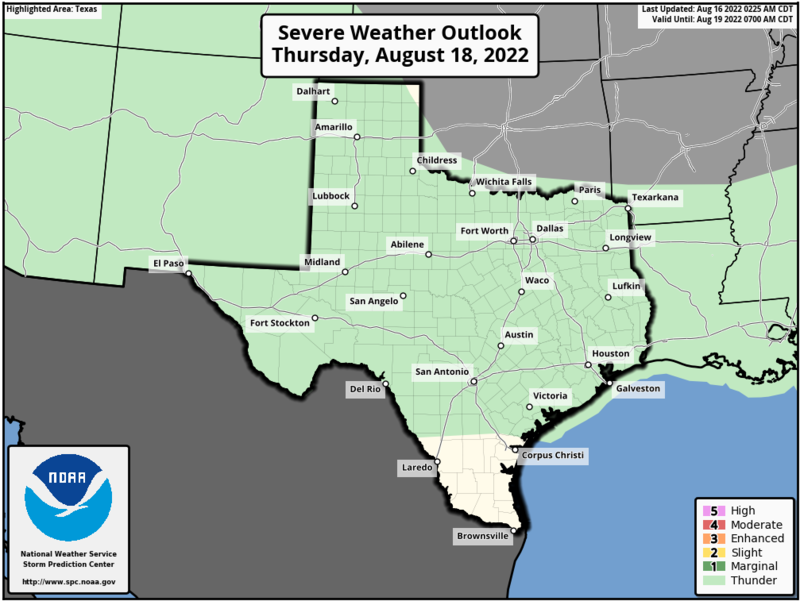 A Level 1 (Marginal) Risk of severe weather is issued when strong to borderline severe storms are possible. Thunderstorms are expected to be limited in their organization and/or only last a short amount of time. Severe thunderstorm coverage is anticipated to be very low along with marginal intensity. A Level 2 (Slight/Standard) Risk indicates the potential for severe thunderstorms. Coverage of severe thunderstorms is anticipated to be isolated to widely scattered. This is issued for most of our ‘dryline’ days where the number of storms will be limited, but quite intense. Varying levels of intensity are possible and depend on the severe weather setup. This risk is the ‘standard’ risk level for most of our severe weather days. A Level 3 (Enhanced) Risk indicates scattered to numerous severe thunderstorms are possible. This risk is issued when a higher concentration of severe weather is possible. Varying levels of severe weather intensity are expected, but the risk for higher-end severe weather increases. Depending on the setup there could be an increased risk for several tornadoes (some strong), giant hail, and/or widespread damaging wind gusts. A Level 4 (Moderate) Risk is rare and indicates increased confidence in a significant severe weather event. Numerous severe thunderstorms are expected with widespread severe weather. Several strong, long-lived tornadoes, giant hail, and/or widespread destructive wind gusts are expected. The specific hazards will depend on the setup, but intense severe weather is likely. A Level 5 (High) Risk is very rare. A High Risk is issued only when confidence is high in a major outbreak of tornadoes and/or a long-lived derecho with hurricane-force wind gusts. Violent, long-lived tornadoes, giant hail, and/or an intense derecho are probable. While any of the above risk levels can and do produce high-end impacts, a high-risk issuance is a precursor to a ‘Red Letter’ day with devastating impacts. Severe weather outlooks are based on probabilities. Mainly the probability of severe weather occurring within a 25-mile radius of any given point. An example is severe weather occurring within 25 miles of your location. While the more significant severe weather is more probable in higher-end risks, destructive hail and strong tornadoes have occurred in all risk categories. The Storm Prediction Center issues hazard-specific probability graphics on all ‘Day 1’ outlooks. Most don’t know that you can actually get probabilistic information on the chance of a tornado, damaging wind gust, or severe hail separately. These hazard-specific probabilities correlate directly to the general five-level risk system. First example: A house has a fifteen percent (15%) chance of severe hail within twenty-five miles of its location. That probability of hail correlates to a level two risk of severe weather. At the same time, the risk of a tornado within twenty-five miles is two percent (2%). A two percent tornado risk correlates to a level one risk of severe weather. A second example: A house has a thirty percent (30%) chance of severe hail within twenty-five miles of its location. That probability of hail correlates to a level three risk of severe weather. At the same time, the risk of a tornado within twenty-five miles is fifteen percent (15%). Hail and damaging wind gusts tend to be more common than tornadoes. As such, the fifteen percent probability of a tornado (which could be significant) within 25 miles correlates to a level four severe weather risk. Unlike Day 1 outlooks, there are no hazard specific probabilities involved in the Day 2 severe weather outlook. These outlooks use the combined probabilities of experiencing a tornado, large hail, and/or damaging wind gusts. A thirty percent (30%) chance of severe weather means you have a nearly one in three chance of having severe weather occur within twenty-five miles of your location. That equates to a level three severe weather risk. The Day 2 severe weather outlooks are updated twice a day. Unlike Day 1 outlooks, there are no hazard specific probabilities involved in the Day 3 severe weather outlook. These outlooks use the combined probabilities of experiencing a tornado, large hail, and/or damaging wind gusts. A thirty percent (30%) chance of severe weather means you have a nearly one in three chance of having severe weather occur within twenty-five miles of your location. That equates to a level three severe weather risk. The Day 3 severe weather outlook is updated once a day, usually in the early morning hours.